(NewsUSA) - As mayor of D'Lo, Mississippi, one of John Henry Berry's recent challenges included tracking down errant employees -- goats he had positioned to clip the town's ball fields had wandered off. 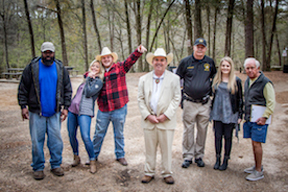 The quest for the goats is an example of the quirky challenges facing Mayor Berry and featured in the reality series, "Small Town, Big Mayor," airing on UP TV on Thursdays at 9:30 p.m. Eastern time. The series offers a refreshing escape from the negative attitude surrounding much of politics today with a behind-the-scenes look at a hard-working mayor and his family who want to make their town a better place and to help it survive and thrive in the future. The residents of D'Lo include 456 people, as well as 240 cows. Mayor Berry wears multiple hats, serving not only as mayor, but also as town arbitrator, dog catcher, landscaper, sewer repairman, volunteer fireman, high school football announcer, Parish drummer, and 4H Firearms Instructor, to name a few. He also finds time to be the father of five children: Ashley, Ben, Autumn, Preston, and Josh; and husband to Angie. The fourth-generation resident of D'Lo is known for his positive attitude, white suits, and the inclination to drive around town in a golf cart. "The love of my town inspired me to run for mayor," says Mayor Berry. "As a native of D'Lo, Miss., I want to improve the town and bring in tourism," he adds. Specific plans to attract tourists include opening a restaurant, he notes. In addition to the restaurant, his goals include legalizing golf carts in D'Lo, making the town more environmentally friendly, putting D'Lo on Kickstarter, building a library, and launching a campaign to recruit new volunteer firemen. Each episode of "Small Town, Big Mayor" will focus on some aspect of his 95-point plan to revitalize the town. In the meantime, Mayor Berry gracefully juggles daily challenges of small-town administrations. "There's nothing I won't do for D'Lo," says Berry. One surprise: "I had to learn to work on the water well and sewage system to keep things functioning properly without spending money the city didn't have," he says. Tune in to "Small Town, Big Mayor" for a taste of genuine community spirit as the citizens rally around the mayor. As Mayor Berry says, "We may be tiny, but we have a lot of heart."